Opening Docx documents can be real pain if you do not have Office 2007 installed on your computer. While there are number of ways to convert docx document into doc and other format, following could be the easiest one. If you are aÂ Gmail user, then you would not require any of that method. 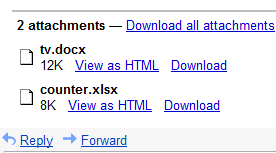 If you receive any Docx file as an attachment in Gmail – just click on ‘view as HTML’ link as shown in image below.